Sylvain Chavanel set the fastest time in the Three Days of De Panne time trial this afternoon on the Belgian coast to win the overall. The Frenchman of team Omega Pharma-QuickStep edged out Lieuwe Westra (Vacansoleil-DCM) by four seconds and Svein Tuft (GreenEdge) by 17 seconds. Westra placed second in the overall as well and Maciej Bodnar (Liquigas-Cannondale) placed third. 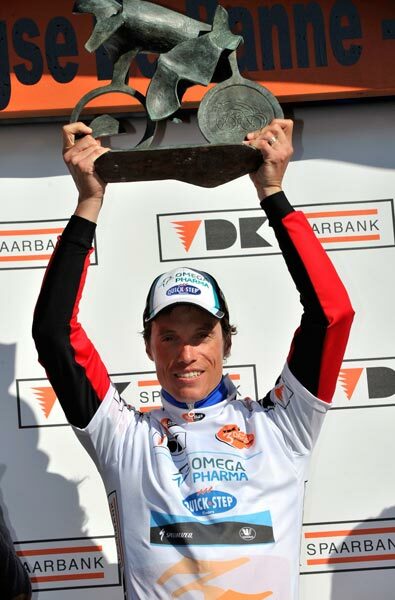 The win gives Chavanel a confidence boost ahead of the Tour of Flanders on Sunday. He started the afternoon 14.7-kilometre stage 12 seconds behind leader Alexander Kristoff (Katusha). Though, he said that he’d been keeping an eye on the overall since the start of the race in Middelkerke. Peter Sagan (Liquigas-Cannondale) won the first leg in Oudenaarde and Marcel Kittel (Project 1t4i) sprinted to win yesterday’s leg in Oostduinkerke. Kristoff won the morning stage and took needed bonus seconds today, but he still couldn’t manage the top time trialists. Chavanel covered the course in 17 minutes, 49 seconds, Westra 18-53, Tuft 18:06 and early pace maker, Travis Meyer (GreenEdge) in 18-32. Kristoff recorded a time of 19-04.